Four people appeared at the Cardiff Crown Court in Wales, with the charges stemming from financial transactions conducted by Jeffrey Bevan whilst employed in the Bermuda Accountant General’s office, with the four defendants accused of laundering the proceeds of $2.5 million allegedly stolen from the Bermuda Government between 2011 and 2013. Detective Chief Inspector Nicholas Pedro, Organised & Economic Crime Department said, “Four people, two from Cwmbran and two from Leicester, have appeared in Court charged in connection with various money laundering offences. “Jeffrey Bevan, 49, and Samantha Bevan, 51, from Cwmbran and Joel Ismail, 41, and Paul Charity, 51, both of Leicester appeared before Cardiff Crown Court on Friday [28th April] charged in connection with various money laundering offences. “The charges stem from a number of financial transactions conducted by Mr. Bevan whilst employed in the office of the Accountant General in Bermuda. 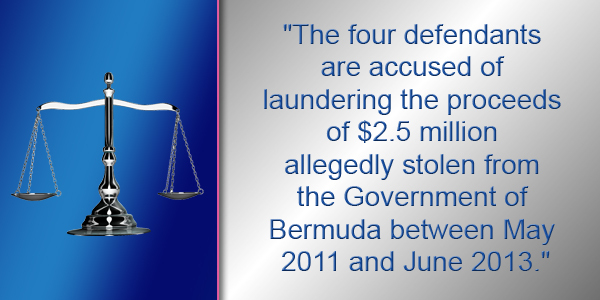 “The four defendants are accused of laundering the proceeds of $2.5 million allegedly stolen from the Government of Bermuda between May 2011 and June 2013. “Jeffrey Bevan faces an additional charge of theft of £50,000 to which he pleaded not guilty. “Paul Charity faces an additional charge of perverting the course of justice to which he also pleaded not guilty.